Foam is awesome! The foam you made is special because each tiny foam bubble is filled with oxygen. 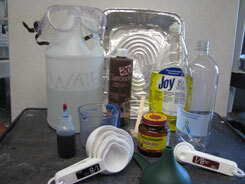 The yeast acted as a catalyst (a helper) to remove the oxygen from the hydrogen peroxide. 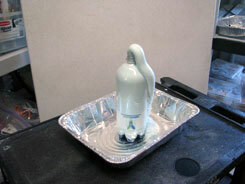 Since it did this very fast, it created lots and lots of bubbles. Did you notice the bottle got warm. 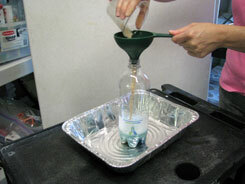 Your experiment created a reaction called an Exothermic Reaction - that means it not only created foam, it created heat! The foam produced is just water, soap, and oxygen so you can clean it up with a sponge and pour any extra liquid left in the bottle down the drain. 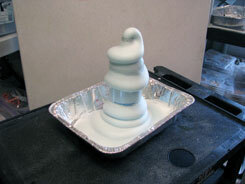 This experiment is sometimes called "Elephant's Toothpaste" because it looks like toothpaste coming out of a tube, but don't get the foam in your mouth!